​Army leaker Chelsea Manning has written from prison on the fifth anniversary of her arrest about how she feared ending up being interrogated at Guantanamo Bay after she was taken into custody by the United States military in 2010. Manning, then only 22, was serving as an intelligence analyst in the US Army when she was arrested on May 27, 2010 and later charged and convicted on counts related to the unauthorized theft and disclosure of thousands of classified government documents. Long before a multi-year legal battle began, however, Manning says she thought her situation may have unfolded much differently. After being arrested on an Army base near Baghdad, Iraq, Manning was brought to Kuwait for several weeks and confined to a small cage inside of a tent with limited access to legal counsel and the outside world. It was there that she considered castration and suicide in lieu of potentially facing the same fate as Al-Qaeda terrorists imprisoned at Gitmo. “It didn’t help that a few of the Navy guards delivering meals would tell me that I was waiting for interrogation on a brig on a US cruiser off the coast of the horn of Africa, or being sent to the prison camps of Guantanamo Bay, Cuba,” Manning wrote for a piece in the Guardian this week. “At the very lowest point, I contemplated castrating myself, and even – in what seemed a pointless and tragicomic exercise, given the physical impossibility of having nothing stable to hang from – contemplated suicide with a tattered blanket, which I tried to choke myself with. After getting caught, I was placed on suicide watch in Kuwait,” she wrote. Manning was convicted in 2013 by a military judge and sentenced to 35-years in prison for taking State Dept. and Defense Dept. documents and sharing them with the anti-secrecy website WikiLeaks. A day after that sentence was handed down, Manning came out publicly as transgender through her attorney and has since successfully petitioned the military to undergo hormone therapy while behind bars. 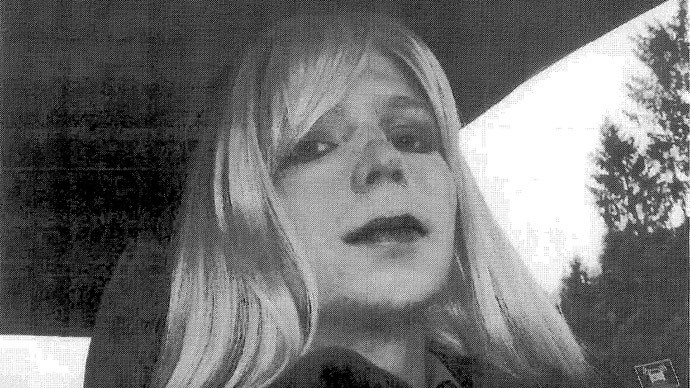 Last year, she legally changed her name from Bradley Manning to Chelsea. “Finally, just under four months ago – but nearly a year and a half after my initial request – I began my hormone treatment. I am still fighting for the right to grow out my hair to the military’s standard for women, but being able to transition remains one of the highest points for me in my entire life,” she wrote. Previously, Manning acknowledged her concerns about being disappeared abroad when she took the stand to testify during a pre-trial court hearing in late 2012. “I didn’t know whether night was day or day was night. And my world became very, very small. It became these cages... I remember thinking I’m going to die,” she recalled at the time. "I didn't think I was going to set foot on American soil for a long time," she said, only to become “elated” to learn the military was flying her not to Cuba or the African horn, but rather to Baltimore, Maryland. She was then transported to a Navy base in Quantico, Virginia before officials relocated her to Fort Leavenworth, Kansas after details emerged about the conditions she endured. Army Col. Denise Lind, who presided over Manning’s court-martial, agreed to take 112 days off of the WikiLeaks’ sources sentence due to her treatment at Quantico. Ironically, among the trove of documents Manning has been convicted of sharing with WikiLeaks are classified detainee assessment briefs concerning Gitmo prisoners. Also on Wednesday, WikiLeaks announced that its added more than a half-million US State Department cables from 1978 to its collection of correspondence that already included hundreds of thousands of classified cables provided by Manning.